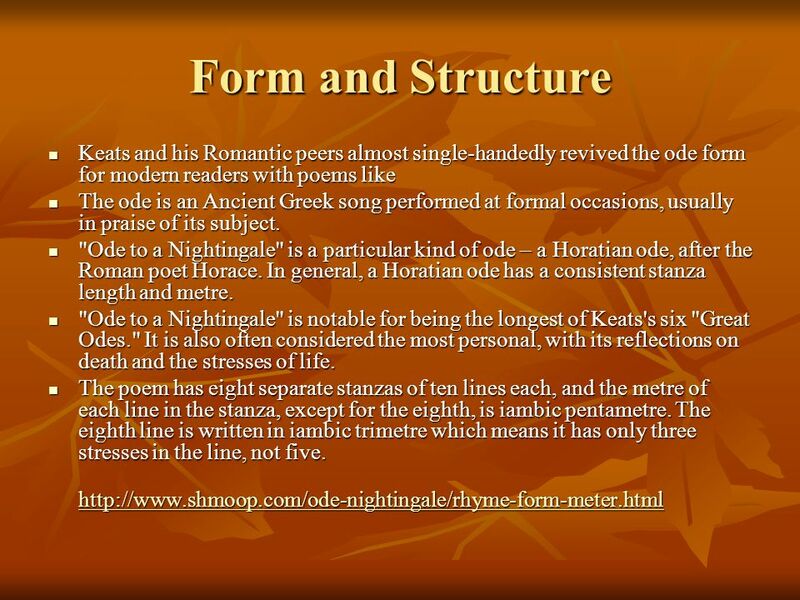 3 Form and Structure Keats and his Romantic peers almost single-handedly revived the ode form for modern readers with poems like The ode is an Ancient Greek song performed at formal occasions, usually in praise of its subject. "Ode to a Nightingale" is a particular kind of ode – a Horatian ode, after the Roman poet Horace. In general, a Horatian ode has a consistent stanza length and metre. 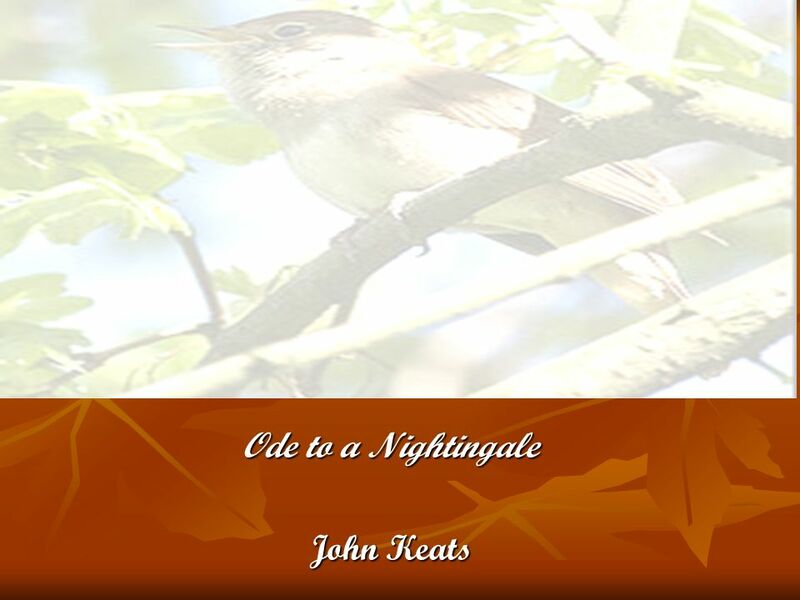 "Ode to a Nightingale" is notable for being the longest of Keats's six "Great Odes." It is also often considered the most personal, with its reflections on death and the stresses of life. The poem has eight separate stanzas of ten lines each, and the metre of each line in the stanza, except for the eighth, is iambic pentametre. The eighth line is written in iambic trimetre which means it has only three stresses in the line, not five. 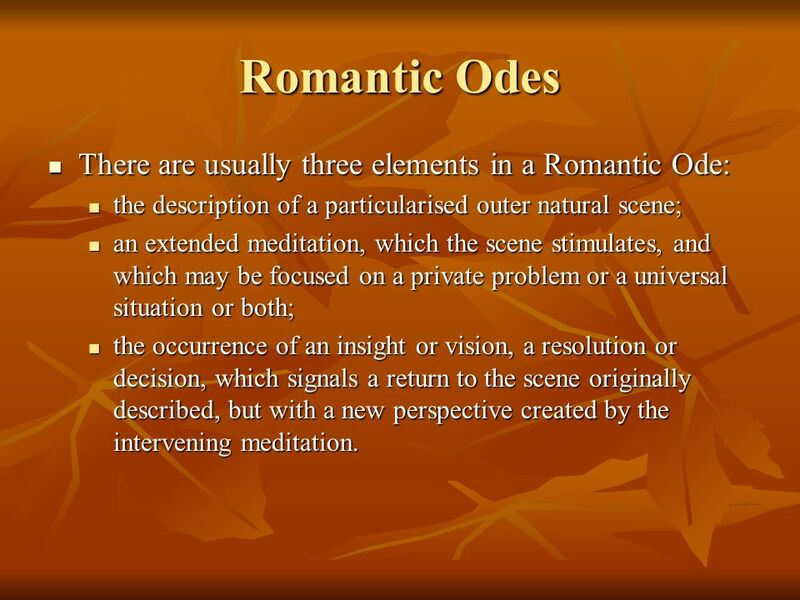 the description of a particularised outer natural scene; an extended meditation, which the scene stimulates, and which may be focused on a private problem or a universal situation or both; the occurrence of an insight or vision, a resolution or decision, which signals a return to the scene originally described, but with a new perspective created by the intervening meditation. 5 Stanza I As you read, pick out which words express his pleasure and which ones express his pain and which words express his intense feeling and which his numbed feeling. Consider whether pleasure can be so intense that, paradoxically, it either numbs us or causes pain. What qualities does the poet ascribe to the nightingale? Feeling of numbness is linked to taking ‘hemlock’ or an ‘opiate’ Romantic notion – loss of sensation = death. The pain the persona feels is sluggish Paradoxically – his distress is a result of being too happy. The nightingale has freedom and a sense of the supernatural There is an idyllic surrounding and everything seems easy for the bird – the persona wishes that creativity came so easily. 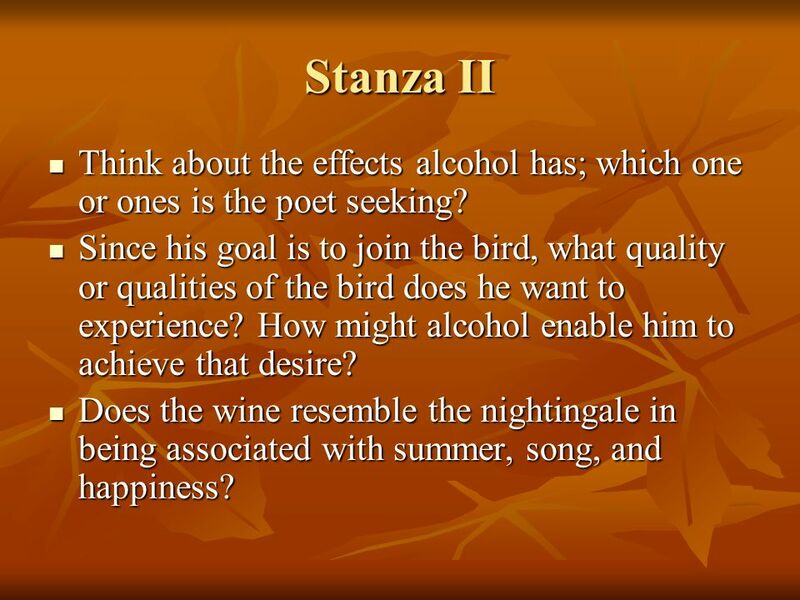 7 Stanza II Think about the effects alcohol has; which one or ones is the poet seeking? Since his goal is to join the bird, what quality or qualities of the bird does he want to experience? How might alcohol enable him to achieve that desire? Does the wine resemble the nightingale in being associated with summer, song, and happiness? 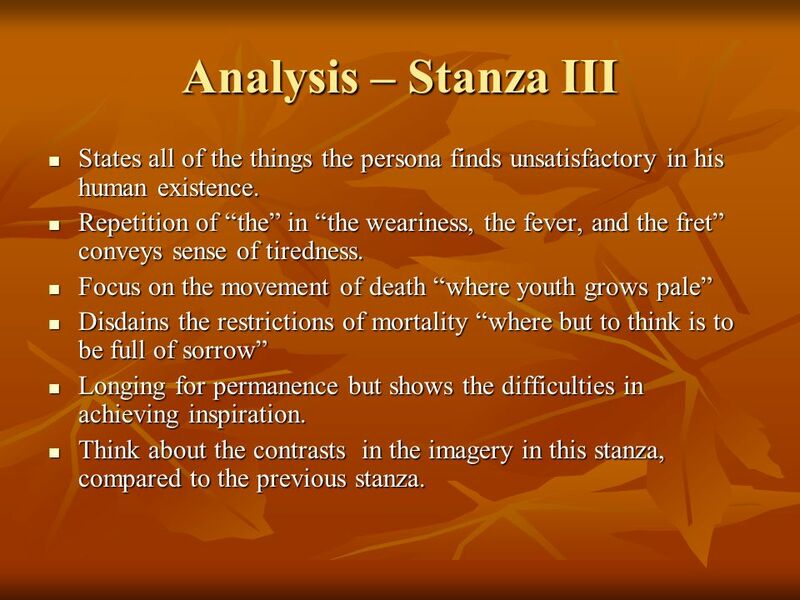 10 Analysis – Stanza III States all of the things the persona finds unsatisfactory in his human existence. Repetition of “the” in “the weariness, the fever, and the fret” conveys sense of tiredness. Focus on the movement of death “where youth grows pale” Disdains the restrictions of mortality “where but to think is to be full of sorrow” Longing for permanence but shows the difficulties in achieving inspiration. Think about the contrasts in the imagery in this stanza, compared to the previous stanza. 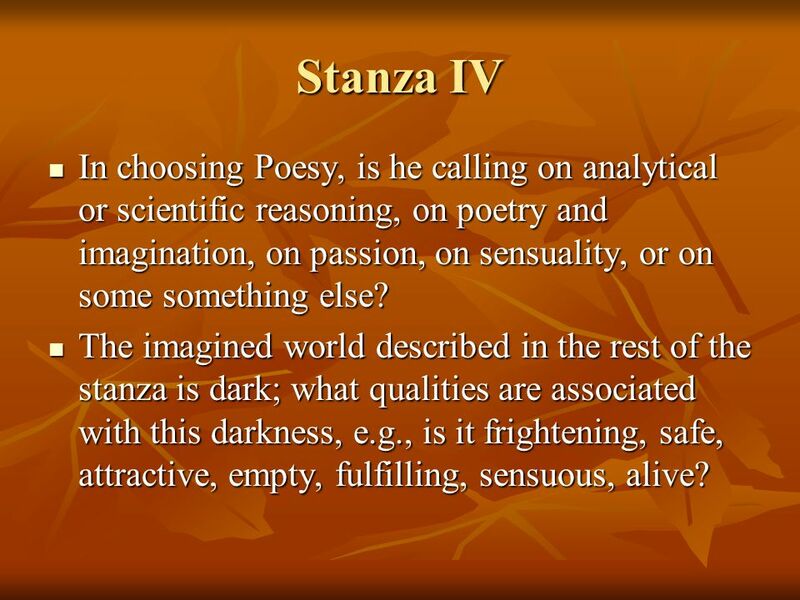 11 Stanza IV In choosing Poesy, is he calling on analytical or scientific reasoning, on poetry and imagination, on passion, on sensuality, or on some something else? The imagined world described in the rest of the stanza is dark; what qualities are associated with this darkness, e.g., is it frightening, safe, attractive, empty, fulfilling, sensuous, alive? 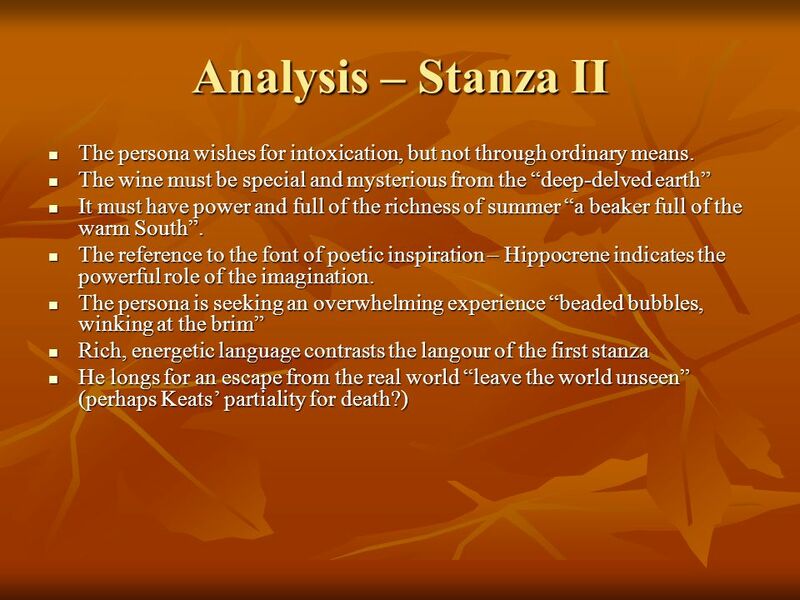 12 Analysis – Stanza IV “Away! away!” sense of agitation at the start of the stanza. He decides that his imagination will take him away to accompany the nightingale. Even though this is flawed “viewless”, he states that the limitations come from human limitations “the dull brain perplexes and retards” He imagines that he is with the bird “Already with thee” and this brings about sensitivity “tender is the night” Inspiration has come from imagination - but even this is flawed “but here there is no light” – he hoped to find inspiration in the heavens, but it is a fantasy. 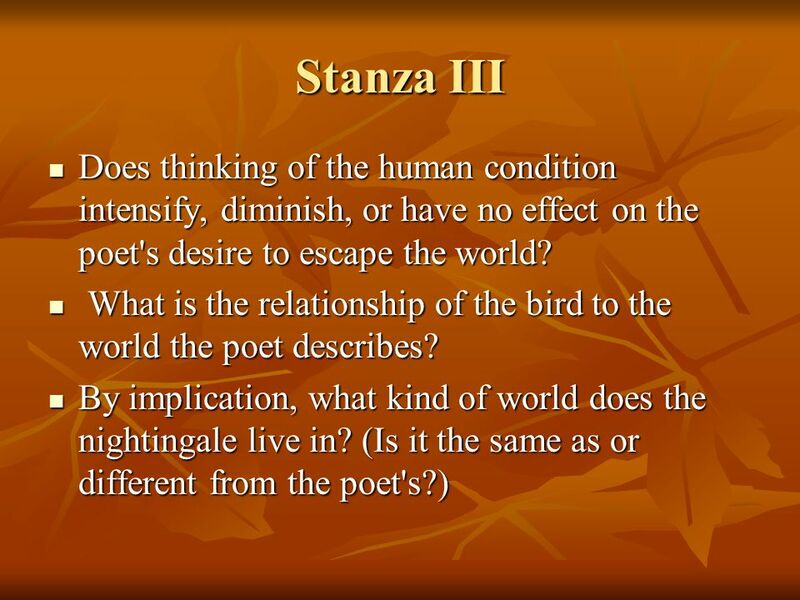 13 Stanza V The imagined world described in the rest of the stanza is dark; what qualities are associated with this darkness, e.g., is it frightening, safe, attractive, empty, fulfilling, sensuous, alive? Even in this refuge, death is present; what words hint of death? In the progression of the seasons, what changes occur between spring and summer? 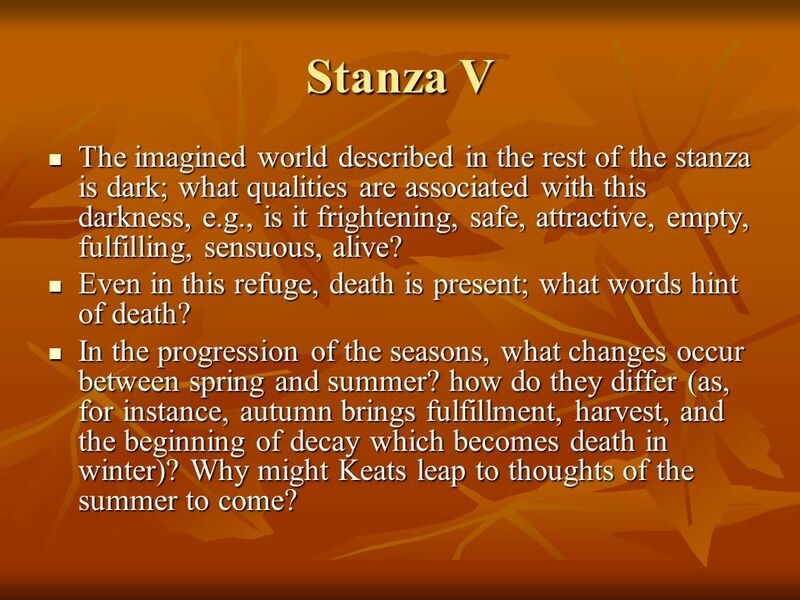 how do they differ (as, for instance, autumn brings fulfillment, harvest, and the beginning of decay which becomes death in winter)? Why might Keats leap to thoughts of the summer to come? 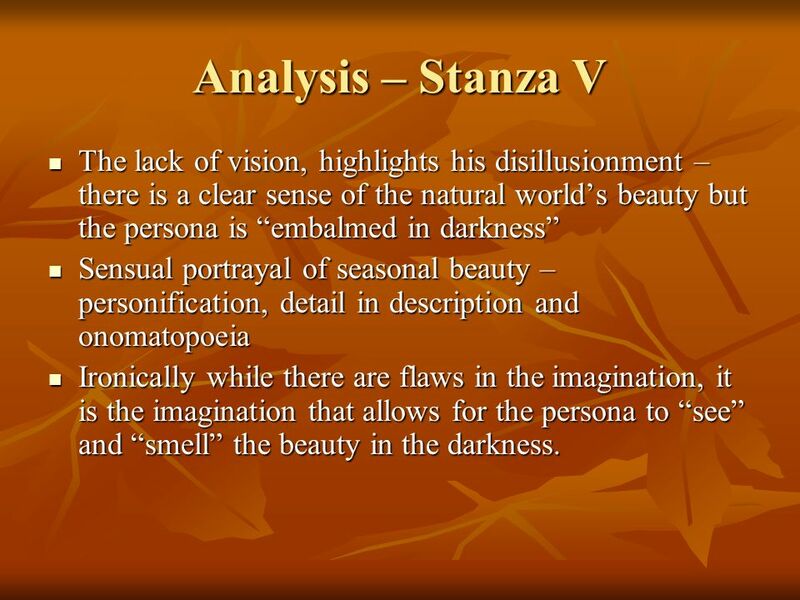 14 Analysis – Stanza V The lack of vision, highlights his disillusionment – there is a clear sense of the natural world’s beauty but the persona is “embalmed in darkness” Sensual portrayal of seasonal beauty – personification, detail in description and onomatopoeia Ironically while there are flaws in the imagination, it is the imagination that allows for the persona to “see” and “smell” the beauty in the darkness. 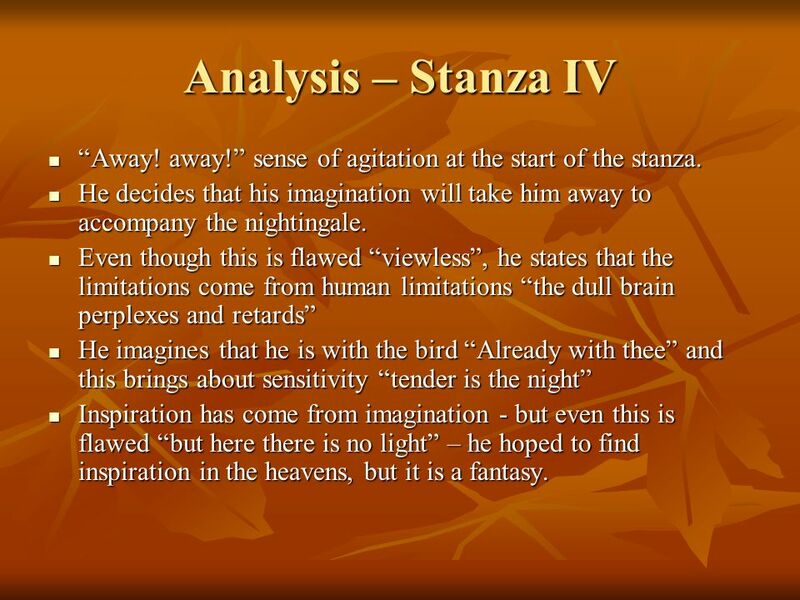 15 Stanza VI Is there any suggestion of the bird's dying or experiencing anything but bliss? Note the contrast between the bird's singing and the poet's hearing that song. What are the emotional effects of or associations with "high requiem" and "sod"? 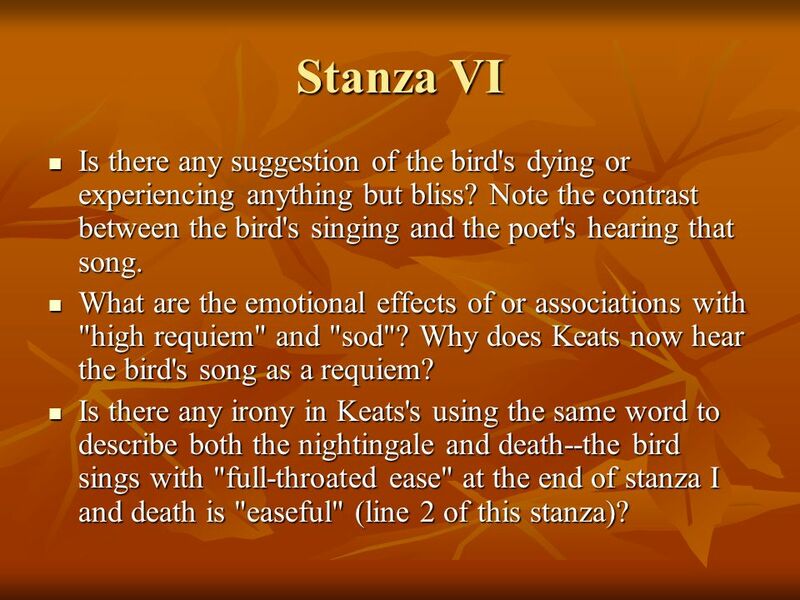 Why does Keats now hear the bird's song as a requiem? 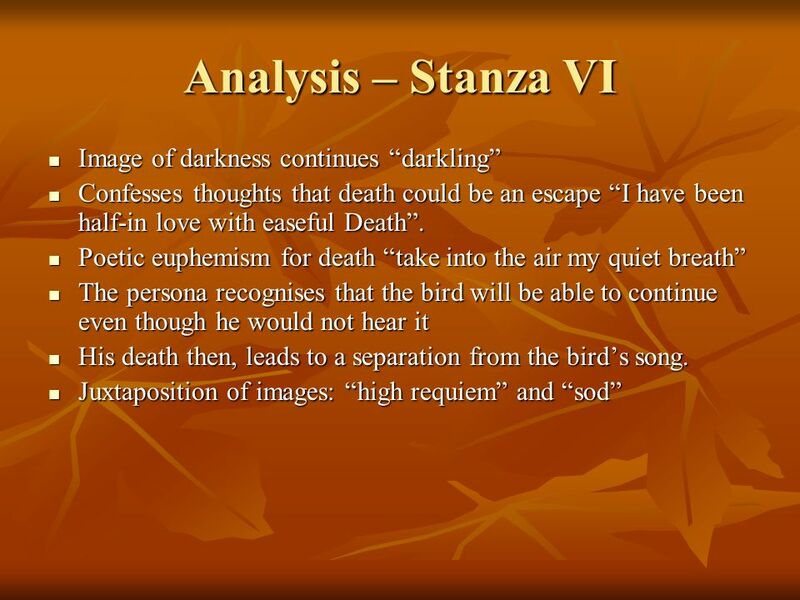 Is there any irony in Keats's using the same word to describe both the nightingale and death--the bird sings with "full-throated ease" at the end of stanza I and death is "easeful" (line 2 of this stanza)? 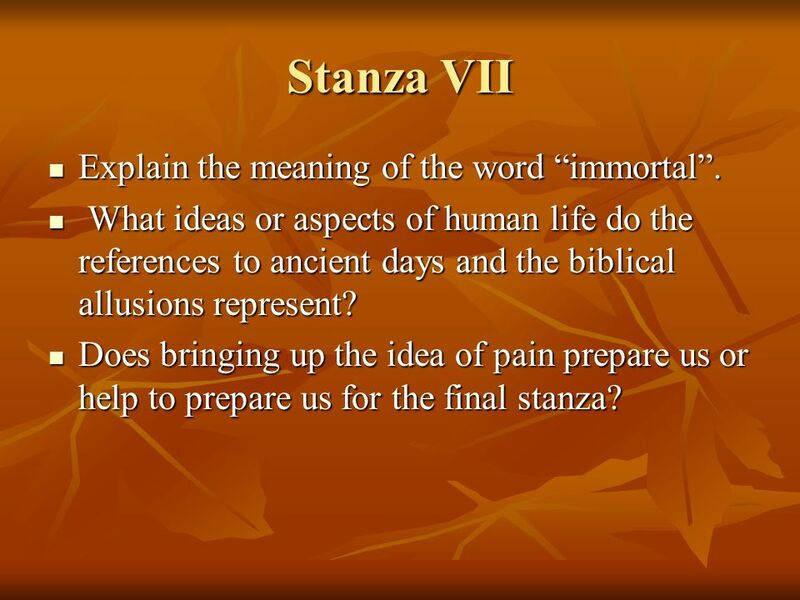 17 Stanza VII Explain the meaning of the word “immortal”. What ideas or aspects of human life do the references to ancient days and the biblical allusions represent? Does bringing up the idea of pain prepare us or help to prepare us for the final stanza? 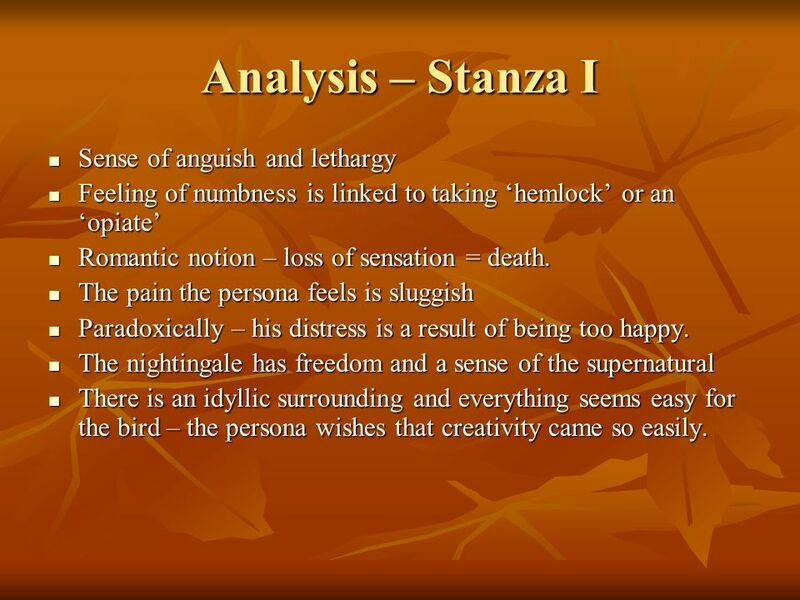 18 Analysis – Stanza VII The significance of the birds and its song is emphasised “thou was not born for death, immortal Bird!” The song of the bird represents perfection and beauty. 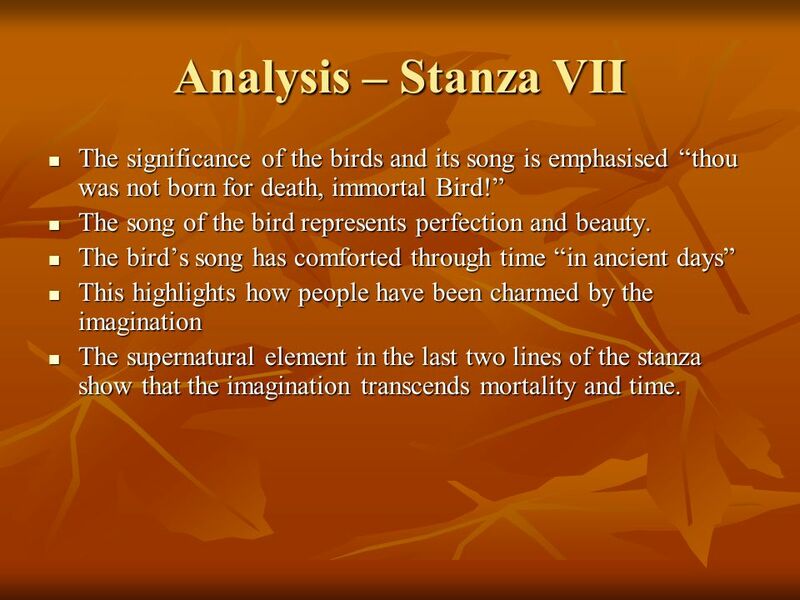 The bird’s song has comforted through time “in ancient days” This highlights how people have been charmed by the imagination The supernatural element in the last two lines of the stanza show that the imagination transcends mortality and time. 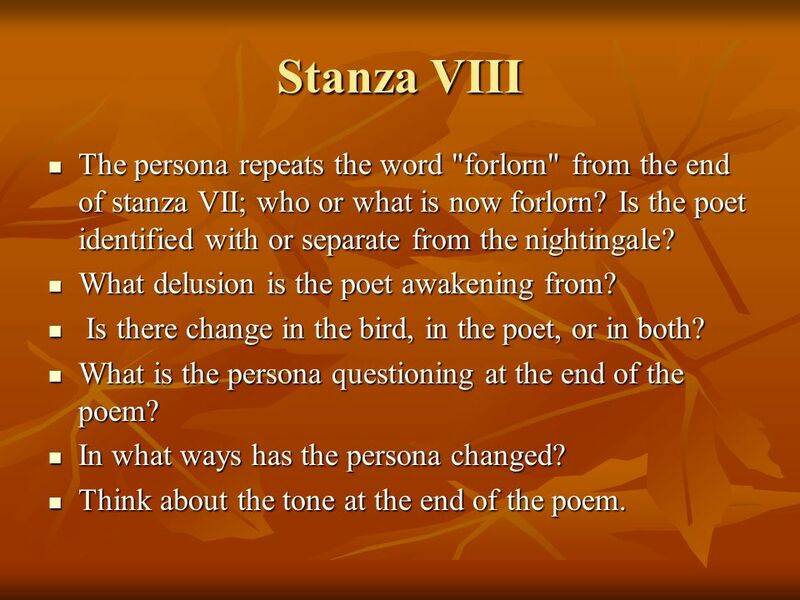 19 Stanza VIII The persona repeats the word "forlorn" from the end of stanza VII; who or what is now forlorn? Is the poet identified with or separate from the nightingale? What delusion is the poet awakening from? Is there change in the bird, in the poet, or in both? What is the persona questioning at the end of the poem? In what ways has the persona changed? Think about the tone at the end of the poem. 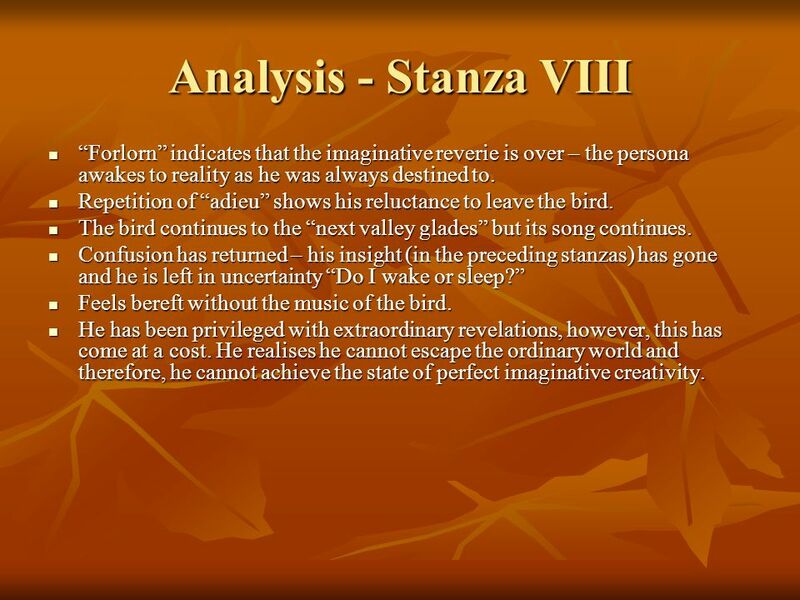 20 Analysis - Stanza VIII “Forlorn” indicates that the imaginative reverie is over – the persona awakes to reality as he was always destined to. Repetition of “adieu” shows his reluctance to leave the bird. The bird continues to the “next valley glades” but its song continues. Confusion has returned – his insight (in the preceding stanzas) has gone and he is left in uncertainty “Do I wake or sleep?” Feels bereft without the music of the bird. He has been privileged with extraordinary revelations, however, this has come at a cost. He realises he cannot escape the ordinary world and therefore, he cannot achieve the state of perfect imaginative creativity. 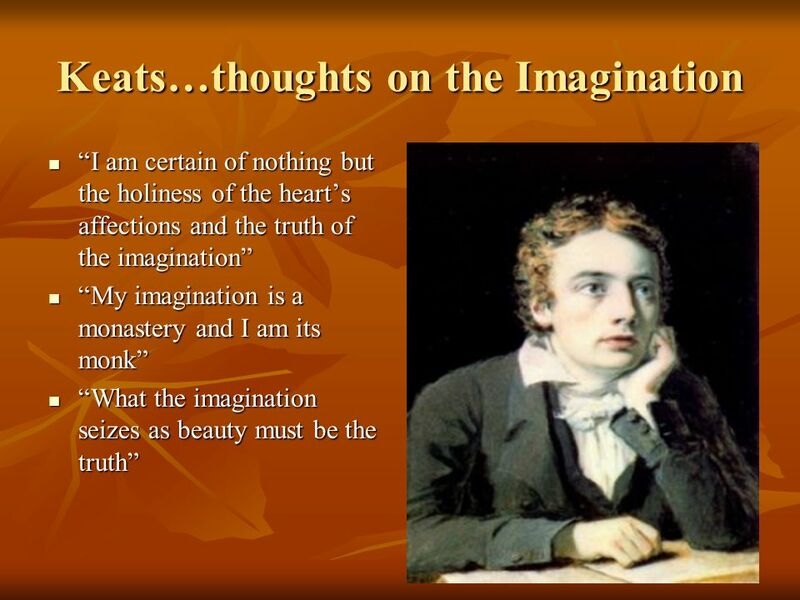 Download ppt "Ode to a Nightingale John Keats"
House on a Cliff By Louis MacNeice. Indoors the tang of a tiny oil lamp. Outdoors The winking signal on the waste of sea. Indoors the sound of the wind. The Oven Bird By Robert Frost. Romantic Poetry (2). I. The World Is Too Much with Us (1807) Theme: The poet laments that in modern society, people are so busy with the earthly life. Final Exam English 326: British Romantic Writers. Poetry Essay Examples How can I form good intro, body and conclusion paragraphs? Romantic Poets. The Rime of the Ancient Mariner First poem in the collection Lyrical Ballads (1798) Imitates earlier ballads in style But uses supernatural. 2H Poetry Relationships. Born Yesterday AO1 and AO2 The poem begins with a metaphor: “tightly-folded bud.” This beautifully evokes the image of a small.